Kimiko Koyama Sensei, President of Usui Reiki Ryoho Gakkai. Finally, Frank Arjava Petter has written the book I wanted to read; placing Reiki within Japan’s culture and spiritual history. I am so grateful he did this because I don’t want to go through twenty-years of training to learn what he has. 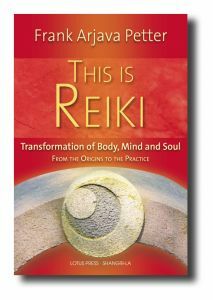 Many Reiki practitioners have written books about Reiki. But few of these authors have immersed themselves in Japanese culture like Frank Arjava Petter. Arjava Petter is not an academic, but he approached his research like a university scholar: he learned Japanese, moved to Japan, studied under Japanese masters, interviewed his primary sources in Japanese, taught and learned with his Japanese students, traveled to the towns and spiritual sites, and worked with Japanese translators to accurately interpret the kanji. All along taking photos to make it easier to visualize. When I studied with Arjava Petter, my sense was, although he understood Reiki’s spiritual origins, he has been a bit shy about emphasizing Reiki’s mystical aspect or reluctant to expose its “secrets” to his Western students – for fear of not being accepted as the wonderful, healing method it is. He taught Reiki’s practical healing applications as being very easy, natural and straightforward. Still, over the past twenty years, as more people have benefited from Reiki’s healing benefits as well as embraced other esoteric practices, the time to explain Reiki’s roots to the West has arrived. – The twenty Reiji-Ho meditation techniques to help build the practitioner’s ability to feel byosen and increase one’s compassion, the fifth Reiki principle. Arjava Petter’s writing style is very much like his classes, open and casual. He brings his love for Reiki and truth along with his personal experiences and photos which not only help explain Reiki but reveals Frank Arjava Petter and how Reiki has changed him. Both this post’s title and the quotes came from This is Reiki. The post’s title is a paraphrase from Usui Sensei’s memorial stone, page 9. The first quote is from a 1994 interview and came directly from page 93. Because there are many Reiki practicioners on my Facebook – I have shared this review.. Looks Wonderful!!! Thank you so much. Someday I will get on FB. Small steps as I said. Arjava Petter does tours to Japan where you get more training and see all the sites. Someday I will go. Check out his website.